Take the Phil Monahan Fly-Fishing Trivia Challenge 02.28.13! Welcome to another edition of our trivia challenge, where we test your knowledge of all things fly fishing and where you might learn a thing or two about this sport we love. The scores on last week’s quiz were pretty outstanding, with eight 100%s, which might be the most ever (well done, 2manydogs, Jason, Adam, Lee, johnnydajeweler, pdfish, Justin, and doug!). I must be getting soft. This one has a couple of easy ones and a couple of doozies, so we’ll see if. 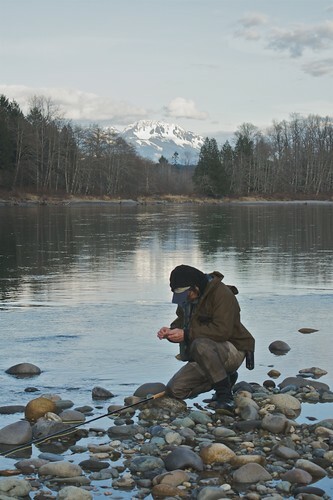 . .
Leland Miyawaki ties on a fly on Washington’s Skagit River. Civil Disobedience? A protest wade-in? Yes, we will step into the river to cast our yarn on Saturday, April 6, despite the fact that the river is closed to all fishing, and then proceed to Department hearings. Why? It is not an easy answer. As some of you may know, the fishing regulations in Washington are not easy to understand. To most of us, they are a quagmire at best. The Skagit River and her famous tributary, the Sauk, hold a dear spot in every steelheader’s heart because they are home to one of the greatest races of spring-returning, wild winter steelhead. History, tradition, and stories abound, as do all our. . . The American economy has been struggling for five years now, and many families have been forced to give up their pets because the expense of dog food is simply too much. A new nonprofit organization based in New York seeks to extend help to families struggling to feed their pets through a familiar method: food stamps. However, these food stamps are not funded by the government, but through. . .
June 1980 marked my third year fishing the Battenkill and also the third year of my fledgling fly-fishing career. The previous fall, I had acquired my first bamboo rod after having spent the summer cutting lawns and saving up to earn the asking price for the rod, $175. It was a 7½ foot 5-weight Orvis Midge characterized by a rich brown coloring brought out by the hand flaming process. . .
A Michigan Humane Society team removes the dog from the property last July. Last July, we posted about a Detroit rapper, Young Calicoe, who allowed himself to be filmed bragging about a bunch of fighting dogs and roosters in a friend’s backyard. He even had the audacity (some might say “stupidity”) to mention Michael Vick. Unfortunately for himbut fortunately for the dogsthe video went viral, and. . .
Kayak Concerto: Fly Fishing South Florida on the Kayak from DAN DECIBEL on Vimeo. DJ Dan Decibel of Skinny Water Culture serves up some killer saltwater action in this fast-paced video. In fact, “killer” is an extremely accurate description of the first sequence, and then things get a little more celebratory. Great cutting to the music gives this video an amazing energy, and I felt my pulse racing by the end. Bravo. sign of how devoted she is to her three young girls. Yesterday was a snow day in Arlington, Vermont, and my friend Bill found himself at home with his three girlsKatie, Ella, and Clarafor the day. 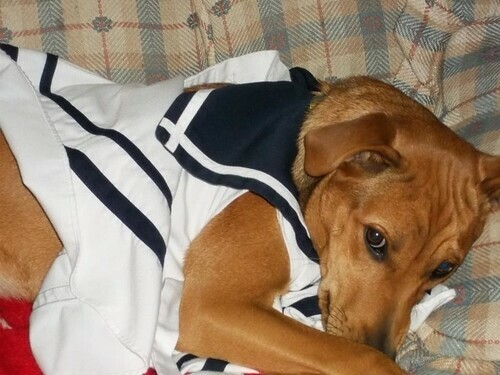 He sent these photos of an epic “dress up” party they had with their beloved hound mix, Bell (short for Tinkerbell). The dog endured the various costume changes with grace and a wagging tail, Bill says, and she was showered with hugs and kisses throughout. Bell was rescued from a kill shelter in Tennessee, and Bill’s wife, Jen, picked her up from a shelter in. . .
We’re thankful for each day they are with us. 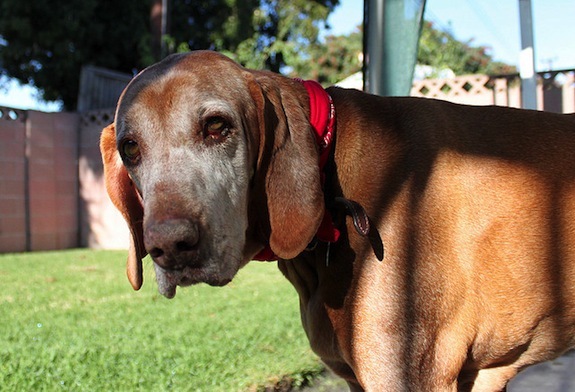 It’s a sad topic, but one this blogger has always been curious about – why do big dogs die younger? Here’s a tragic tale that has a happy ending that offers hope for a dog who has endured a lot of pain and suffering. Jack was a street dog in Iraq who was brutalized until he was rescued by a U.S. Marine, who took the injured dog to a veterinary facility in Kuwait. An organization called The Puppy Rescue Missionwhose tagline is “Soldiers Saving Puppies-Puppies Saving Soldiers arranged for Jack to be flown to the U.S., where he is being fostered by. . . Dubbed the “king of terriers,” the Airedale Terrier hails from Airedale in Yorkshire, England. The popularity of “Downton Abbey” has created a new community of Anglophiles, and BBC America offers a list of dog breeds that most represent “Old Blighty.” From Lord Grantham’s beloved Labrador retriever to the Queen’s Corgis, England is a country of dog lovers, and there are some simply gorgeous breeds listed heresome popular and a few rarities.